When I start a quilt, I create a sub-directory in my main Quilting directory on my computer. In each quilt's sub-directory, I put all the pictures pertinent to the quilt and, most importantly, I create a note file to capture stuff I want to remember later on, when the webpage is made. It's very difficult to remember details months afterwards. Currently, it is March 2011. Do note that this quilt was made in late 2010 .. not terribly far in the past, but distant enough so that those all-important details are but a fuzzy memory. I opened up the sub-directory and ... OH NO!! ... there isn't a note file! Geez, I hate being a lamer. Thank GOODNESS that I was chatty enough during the construction to post about what I was doing About.com's Quilting forum (the main quilty place I hang out). Thank goodness the search function works, as I was able to find all the posts I had made about this quilt! 11/11/10: I have started "Lumiere de Noel". I first saw it in a quilting catalog and just loved the two fabric coloring featuring a specific Moda fabric line. 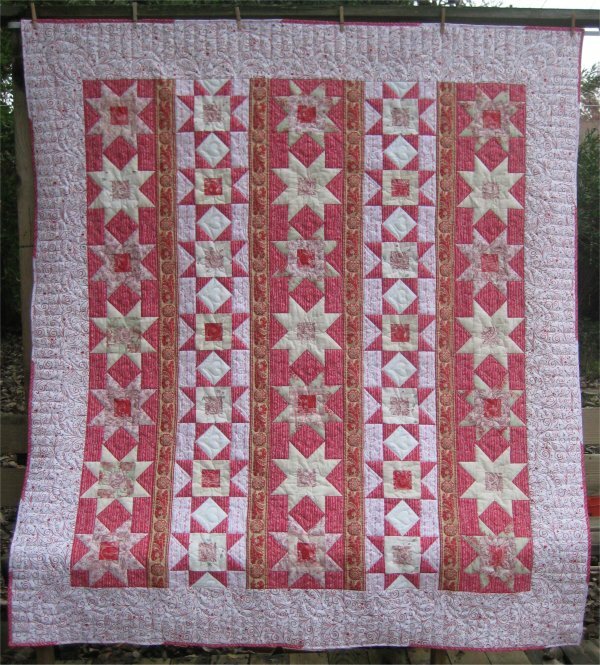 But it was such a SIMPLE layout (variant Sawtooth Star blocks in columns with a ribbon border stripe between the columns as sashing and finished with a slab-o-border), I didn't want to spring for the kit. Besides, I knew I had enough stash fabric to make it. So, I just clipped the catalog picture as a memory jogger. I went surfing around the internet and found a better picture of Lumiere de Noel for reference. And I found lots of sites offering the kit, the fabric and/or just the pattern. Then I found yardage requirements for it! 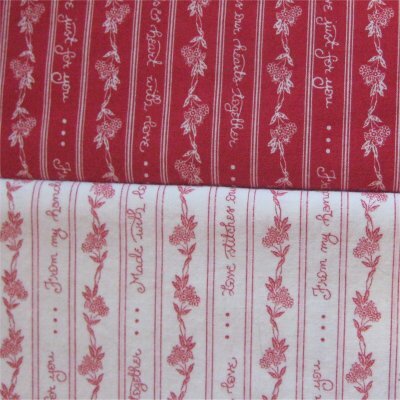 Augment: The minute I saw the pattern, I remembered the red/white positive/negative fabrics I had stashed away. If there was enough of them, they would do nicely for the background of the stars. I wasn't sure about that linear stripe ... I knew I didn't own anything like that; I'd need to go looking for it. Linear stripes are tricky ... they are either in fashion and available or they are nowhere to be seen. Sure enough, I couldn't find anything suitable in my stash and linear stripes are obviously Out Of Fashion at this time (or at least, my local quilt stores aren't carrying them). 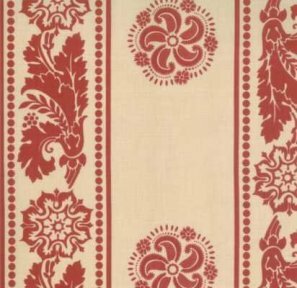 Since I would need to purchase a linear stripe, I figured I might as well get the 'official' stripe per the Lumiere de Noel pattern. A little bit of internet search turned up an online quilt store that stocked it. I definitely needed a very specific length, as the stripes were cut lengthwise. I noted this on my order and hoped that the store had enough yardage on hand. 11/19/10: I was waiting on a linear stripe to arrive via the mail. Hooray, hooray, the shop had the length I needed and it arrived. I washed the fabric, fussy cut the linear stripes and now am using those stripes as sashing between the Sawtooth Star columns. But sewing L-O-N-G stretches of straight seamlines is just plain tedious. If the sashing wasn't enough punishment, once they are sewn, I get to do more long seamlines with the slab-o-borders. OH NO! (again) I should have used that No-Doze. Or I shouldn't have worked on the quilt when I wasn't alert. Or maybe I shouldn't have been watching the TV at the same time as sewing. After I sewed all the sashings in between all the rows and stepped back to view my work-in-progress, I spotted it. A GLARING ERROR. Oh. My. Gosh. A Cesspool of Puss. Grade: D-. Do you see it? Look again. Look more closely. Surely you see it? In each of the linear stripes, there is a circular, flower design. Below that flower is a stylized leafy-thing. On one side of the leafy-thing there is a part that curls. In the photo above, look at the linear stripe on the left; that curl is on the top/right of the leafy-thing. Now look at the other stripe. That curl is on the bottom/left of the leafy-thing. I had sewed one of the linear stripes UPSIDE DOWN. Who knew they were *directional*!??!? aarrrggghhhhh! 12/5/10:Worked out a quilting design for Lumiere de Noel on paper. 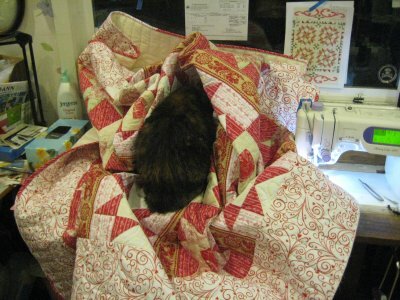 Loaded a doodle cloth (destined eventually to become cage liners for our cats' vet) and practiced the quilting. I'm very glad that I did because some of the designs just didn't work out nicely. Eventually, after playing around a bit, I think I've settled on what the final quilting design will be. I railroaded the quilt onto Lizzie (i.e. lengthwise is parallel to the rails) so that I could quilt each column in one pass. I'm using Quilter's Dream Puff for the batting .. a first time for me. I'm hoping that the final quilt is nicely poofy. And I like swags and beadboard. In fact, I *LOVE* swags and beadboard. Doing swags is so easy when you have a template and I use the No-Frills swag template from Constantine Quilts. (She has a fantastic set of videos on her site, at the above link, to show you how to figure out the number of swags to put on a side and what to do about the corners.) For this quilt, I used the 5" swag template. Here's a photo of the border with the swag and beadboard quilted .. and a drawn outline of the stitching so you can see it better. Inside the innermost swag, I quilted a free-motion, free-form flower. The corner got a similar quilting motif. 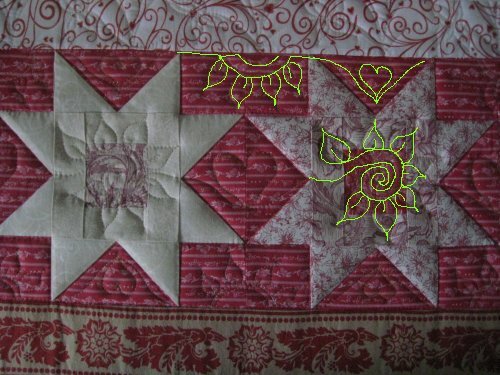 Notice how you can hardly see the quilting in the border? But, *I* know it's there. 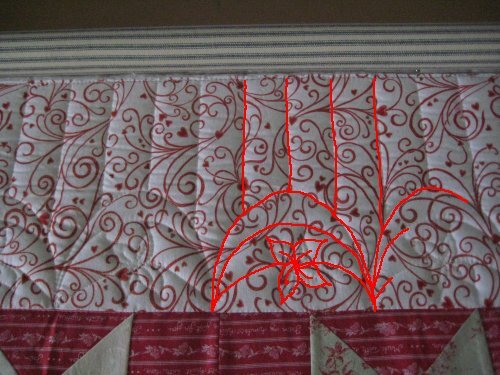 In any case, *YOU* beware not to ask for detailed quilting where it won't be seen! 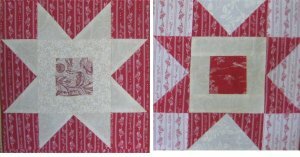 Once the border was taken care of, I progressed to quilting the columns of stars, which due to loading the quilt crosswise, the columns were now rows .. making it much, much easier to quilt in one pass. I wanted the quilting to be continuous. I really dislike stopping and starting designs; you have to bury the tails (I don't like to take tiny stitches or use Fray Check/Fray Block). Burying a lot of tails takes time and it's boring. So, I devised a quilting path from one end to the other ... each star was stitched in the ditch for definition and stability; in the squares that were created between the stars, there is a heart. In the stars themselves, I did a spiral with leafy embellishments. 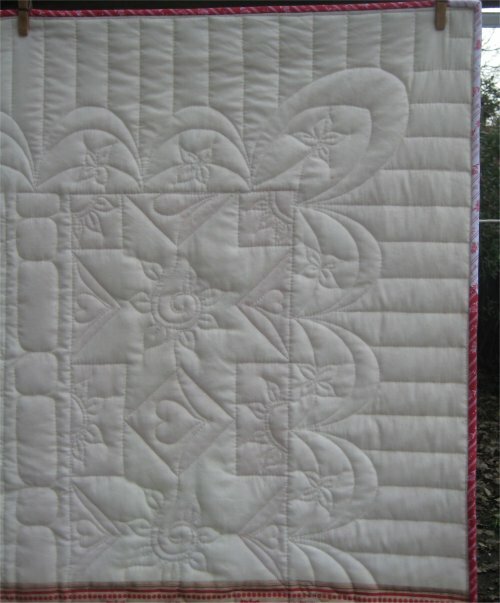 In the other areas of the stars, I quilted a double arc with leafy embellishments and repeated the heart. Then there was quilting the linear stripe fabric. Geez ... I didn't have a CLUE how to do that. I ended up just quilted an outline around the motifs. Lame. You can see this better on the back, since I used plain muslin as the backing. I have taken to liking the use of muslin as the backing. Not only does it soften with laundering, but it shows up the quilting rather nicely. Hmmm ... which could be a detriment, yes? :-) But, being the cheap frugal person that I am, I buy an entire bolt of 108" wide muslin with a discount coupon and that brings the cost of the backing down very low. The extra wide fabric means that I don't have any seams (unless I want to insert something). I definitely do not use quilting cotton for backings any longer ... I just can't justify the cost. The very last thing is the label. 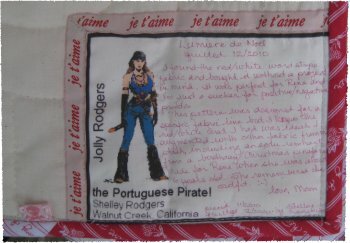 For quilts that I keep or give as gifts, I always sew my "pirate" label into a corner. Since I found a teeny-tiny pirate machine embroidery design, I have made a bunch of small pirate tags, which I also include when I put on the binding. You can see the pink pirate tag to the left of the pirate label. I don't use my embroidery machine as much as I should. Nowadays, I'm trying to remember to make an additional embroidered label. This one was done with a gorgeous *free! * Sue Box design. Her designs are always superbly digitized. They are simply exquisite. Didja notice the special ribbon around each label??? 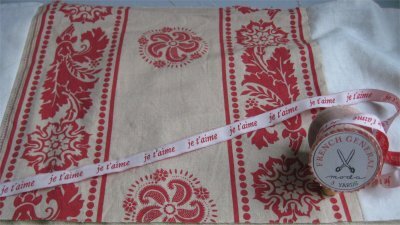 When I was persuing the internet for the linear stripe fabric, I happened to come across an online shop, Quilter's Quarters, that carried this Moda ribbon ... it's designed to coordinate with the Lumiere de Noel fabric line. Although I only used the linear stripe from this line, I just fell in love with this ribbon. It was so special and so unique AND it came wrapped around a cute wooden spool! I emailed the owners, Shawn & Jerry, to ask how much yardage was on each spool. A prompt reply gave me the amount, which would be more than enough to border the labels. Even though the price was steep (for a ribbon! ), I figured it would be a beautiful, final touch for this quilt and I ordered it. A small amount of time later, a second email came in with a corrected yardage; originally, the yardage hadn't been actually measured. Sadly, it was less than what was originally quoted. With the smaller amount of yardage, I couldn't justify the purchase and regretfully instructed Shawn & Jerry to cancel the order. Well, it turned out that they had already run the charge and boxed up the purchase. To make things right, they made an offer to me that was quite acceptable. I can say, without equivocation, that Quilter's Quarters is a stand-up operation. An inadvertent mistake was made and was very graciously corrected. I wouldn't hesitate to do business with them again. 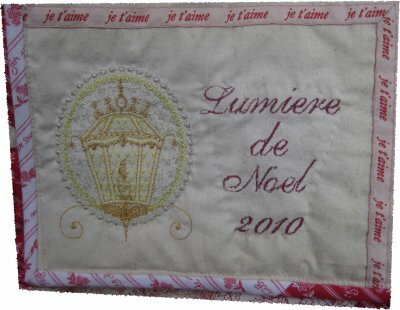 12/20/10: Completely finished Lumiere de Noel last night ... bound, washed & pictures taken! I did need to send it through the wash twice ... I had used yellow chalk to mark guidelines and they didn't come out in the first wash. Application of "Shout" gel took care of them during the second wash.